One thing that will never go out of style at baby showers is chocolate, guaranteed. Some would say that a baby shower would not be complete without chocolate! What does go in and out of style at baby showers, then, is the way in which that chocolate is served. 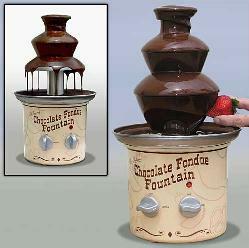 An up and coming party trend that is becoming quite popular lately is the Chocolate Fountain. Why are Chocolate Fountains Becoming so Popular? Baby shower chocolate fountains are becoming popular because it is a novel and interactive experience. There is just something fascinating about dipping food into a waterfall of melted chocolate. Plus, everything tastes better with chocolate! Right? A chocolate fountain is also an elegant and impressive centerpiece for the baby shower. Not every party features a chocolate fountain so it is a unique centerpiece to have. Also, a chocolate fountain is a popular baby shower food idea because it simplifies your menu. You serve chocolate and dippers. That's it! Minimal preparation is required. And with so many other things to plan for at the baby shower, it is nice not to have to worry about the baby shower food. What type of Dipper should You Use? Should You Have a Chocolate Fountain at Your Party? If you love chocolate, then Of Course! :] Actually, there are plenty of other ways to feed your chocolate craving other than a chocolate fountain. It depends on how big you want the baby shower to be. If you have the budget and want a sure way to WOW the guests then a chocolate fountain would be a perfect touch to your baby shower. If you are going for simple & sweet, then a baby shower chocolate fountain might be too much - and you could try some of these Chocolate Dessert baby shower recipes to give your guests that chocolate fix. They are somewhat expensive, so they are more of a luxury than a "must have." You can rent one at a party rental store - but be sure to rent one in your price range! There are several "types" and some are much more expensive than others. Some chocolate fountains are very big and there are smaller ones as well, which are less expensive, so shop around at a few different places to get the best price.